How to restrict the CheckBox from being checked or unchecked? 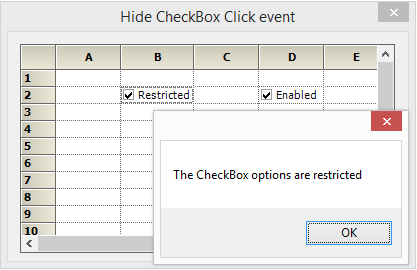 The CheckBox options can be restricted from being changed to the checked or unchecked state by using the CheckBoxClick event when the CheckBox cell is clicked. In the given sample, a message box shows up while clicking on the restricted CheckBox cell. The following image shows the alert message on clicking the CheckBox option. Note: In the given sample, the options are prevented while clicking on the CheckBox, but the CheckBox option can be changed by using the space bar.